Denna produkt ger dig 774 bonuspoäng. 2-våningsvagn 2:a klass DPZplus Bt typ SBB/CFF/FFS, vagnen har inredning, längd över buffertar 27,3 cm, epok VI. Prototype: Swiss Federal Railways (SBB/CFF/FFS) type DPZplus Bt, 2nd class, painted and lettered for the Zürich S-Bahn. The car looks as it currently does in real life. 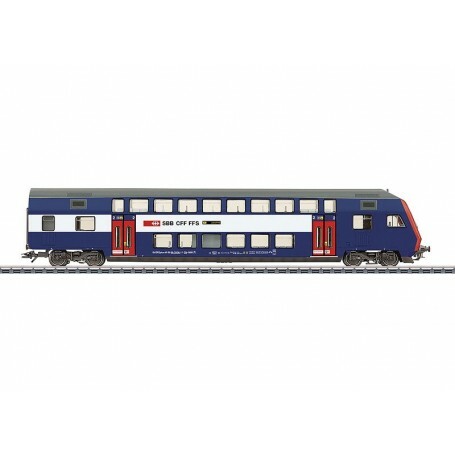 Model: The car has a detailed buffer beam with separately applied streamlining. The train destination sign is lighted. The cab has interior details. Current-conducting 7319 plug-in coupling drawbars or 72020/72021 close couplers that can be uncoupled can be installed on the car. Length over the buffers 27.3 cm / 10-3/4'. When operated control car first, triple headlights shine. When operated control car last, dual red marker lights shine.